Horns are growths that protrude from the skulls of some species of animals, including the species "cattle." In cattle (as well as some other horned species) both males and females can have horns. Since a "cow" is a mature female belonging to the species cattle, "cow horns" are well, horns on cows. If a bull or steer has horns, they are called, logically enough, bull or steer horns. However, since all horns are basically the same (whether they're from a cow, bull, etc. 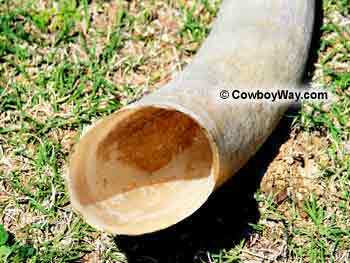 ), many people simply call pretty much any horn a "cow horn." Below: A Texas Longhorn cow with horns. 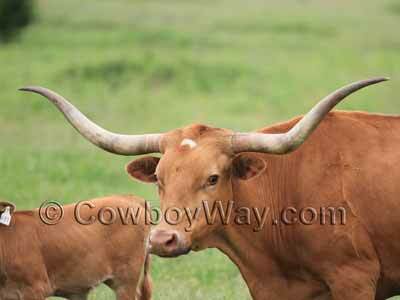 While the Longhorn breed is famous for their horns, other breeds of cattle have them also. Below is information on what horns are, and what animals have horns. 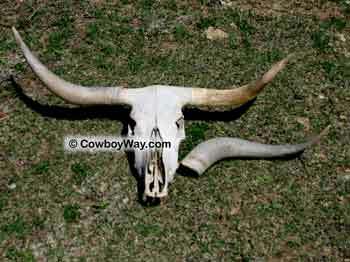 If you are looking for cow horns and skulls for sale you can find them here. Horns are growths that protrude from the skulls of some animals. Horns are made of two components: 1) bone and 2) keratin. The bone is the center, or core, of the horn and is fused to the bone of the skull. The bone core is covered by a resilient sheath (protective covering) made of keratin. Horns are a permanent part of the animal, which means the horns an animal is born with are the same horns it has its entire life. In other words, horns are not annually shed and re-grown like antlers. Horns do not branch out, but instead end in only one point on each side of the animal's head. Depending on the species of animal horns might be found on both males and females, or males only. 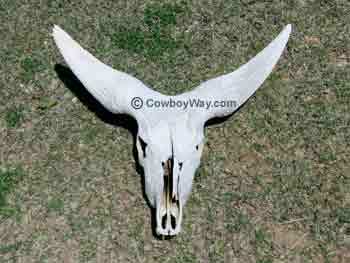 Below: The skull of a Longhorn cow. On the right-hand side of the photo the keratin sheath that protects the bone core of the horn has slipped off and is lying on the ground beside the skull. There is at least one exception to the description of horns given above. This exception is described a little lower on this page under the heading, "Pronghorn Horns - An Exception To The Rule." Horns are found on animals from the family Bovidae. The family Bovidae includes such species as cattle, sheep, goats, gazelles, antelope, bison, buffalo, and others. Bovids (animals from the family Bovidae) roam across the continents of North America, Europe, Asia, and Africa. In many species of Bovids horns are found on both males and females, but in some species are found on males only. As already stated horns are permanent growths made of bone and keratin, they do not branch out, and are found on animals belonging to the family Bovidae (Bovids). Nature, however, can be both curious and complicated. In the case of what defines a horn, the American Pronghorn Antelope is an interesting exception. From the family Antilocapridae, the Pronghorn has horns that have two major characteristics in common with animals from the Bovid family: 1) their horns are made of a permanent bone core and 2) the bone core is covered with a keratin sheath. However, while Pronghorns (like Bovids) do not shed the bone core of their horns. Pronghorns (unlike Bovids) do shed and re-grow their keratin sheaths. There is another difference between Pronghorn horns and Bovid horns: Pronghorn horns branch out while Bovid horns do not. Because of these differences some people describe the Pronghorn as not having "true" horns. Why Do Animals Have Horns? Horns are used by animals as weapons of defense, for fighting or display during mating seasons, and/or as a symbol of rank. Some animals with horns also benefit from the blood vessels in the bone core acting as a natural radiator, helping to keep the animal cool. Below: The skull of an 18 month old Watusi heifer. The Watusi is a breed of cattle known for growing horns that are both long and big around. What Do Horns Look Like? Horns come in a wide variety of shapes, sizes, and lengths. Horns can be nearly straight, gently curved, tightly curved or curled, or spiraled. While it is most common for an animal with horns to have only one set (one horn on each side of its head), certain animals, such as some sheep, have more than one set of horns. As stated previously on this page, horns are made of a bone core covered with keratin. So, what are bone and keratin? Bone is a porous, mineralized, and rigid organ. While it is one of the two items that make up a horn, bone is probably best known for making up the endoskeleton of vertebrates. In a living animal bone is alive, made up of osseous tissue, blood vessels, nerves, marrow, and other components. Keratin is a tough, non-mineralized, protein. It not only makes up the sheath of a horn, it is also a primary component of hair, nails, claws, hooves, feathers, and the shells of tortoises, turtles, and terrapins. Below: A close-up of a keratin horn sheath. When a horned animal is alive there is a thin layer of tissue between the of the horn and the keratin sheath. After the animal dies this tissue decays and the sheath can often be slipped off the bone. which is from the family Antilocapridae). Horns are made of two components: 1) a bone core, and 2) a keratin sheath. The tip of a horn ends in only one point on each side of the head. In other words, horns do not branch out. Antlers typically do branch out. The word "polled" means an animal that is naturally, or genetically, without horns. An animal that was born with horns but had them removed at some point would be described as "dehorned," not polled. The word "muley" is a casual or slang term sometimes used to describe cattle, and means the same thing as polled. 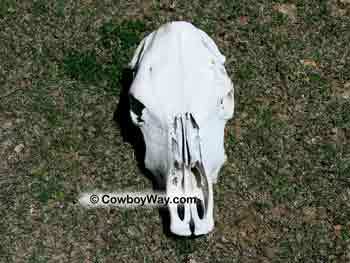 Below: The skull of a polled cow.